How far would you go to find the perfect croissant? With so many wonderful bakeries in the city, Londoners like me are lucky enough to have some pretty amazing options on our doorstep. Fancy venturing a little further afield? 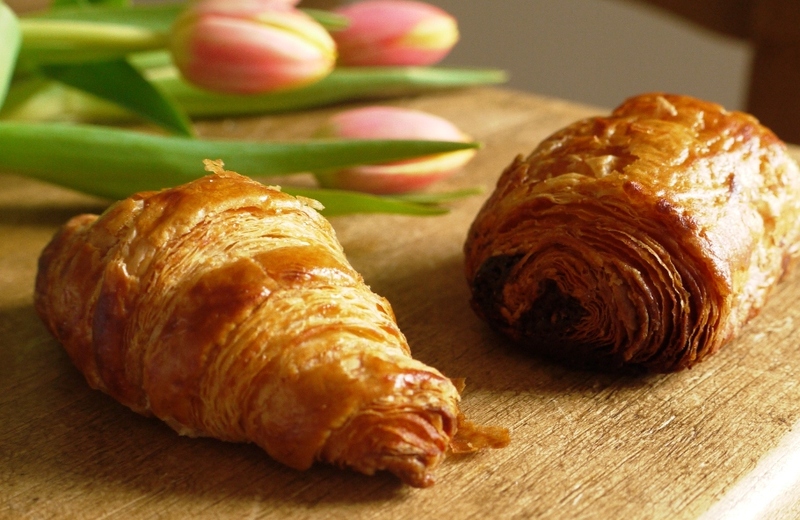 France is your obvious answer, synonymous with the very best croissants in the world and only a couple of hours away. Doable in a day, definitely, and not so completely crazy if you’re really on a mission to find that perfect pastry. I’m going to throw another option into the mix. How about we travel for twenty two hours, averaging around 500 miles per hour, covering nearly 11,000 miles and ending up in Surry Hills, an inner-city suburb of Sydney, Australia? We’ll head for Bourke Street, number 633 to be precise, and before you can even begin to feast your eyes on the incredible array of bread, cakes and pastries displayed in the window, you’ll detect the irresistible smell of butter and baking that draws Sydney-siders to Bourke Street Bakery like moths to an irresistible, edible flame. I’m afraid the journey we’re taking is imaginary. I’ve never been to this bakery, and can’t imagine I’ll be visiting any time particularly soon, but I hope I can offer you the next best thing – a taste of one of their incredible croissants. Bourke Street Bakery is something of a Sydney institution. Parisian pastry expert David Lebovitz visited under the strict instructions of Yottam Ottolenghi not to miss it, and calls it ‘somewhere very special’, while the thousands of Sydney residents that visit every day are testament to just how amazing Bourke Street’s baked goods are. And luckily, although the bakery itself (in fact there are now four) is just a distant dream for this London-based little loaf, the owners have also written a brilliant book, meaning I can at least attempt to make some of the awe-inspiring recipes myself. I’ve been making quite a few things from the Bourke Street Bakery book recently: starting a sourdough culture has opened up a whole new chapter I’d previously left untouched, and I’m getting used to the idea of using a pre-ferment to improve the quality of my dough. When I found out that March’s Fresh From the Oven challenge was to make croissants – something I’ve done before using the River Cottage Bread Handbook croissant recipe – I decided it was time to tackle the slightly more complicated Bourke Street Bakery method. The book provides details on how to make a basic croissant dough using ferment, before going on to elaborate on different executions in dedicated sections – pain au chocolat, pain au raisin, praline twists filled with rich crème patissière, two types of fruit danishes and ‘bear claws’: crunchy toed pastries filled with frangipane and dusted in a blanket of icing sugar. All the recipes are accompanied by mouthwatering photos and I definitely want to try them all, but there are only so many hours in the day, so I opted to make my mixture into the most basic two versions, croissants and pain au chocolat. I figure I’ve got to leave something untried for when I actually get around to visiting the bakery in person, right? I made my croissants with some lovely unsalted French butter, drinking in the rich, round smell as I pounded it out into a smooth square with which to laminate my dough. The recipe calls for lots of rolling and resting which means it is somewhat time consuming, but if you’re in the house for a couple of hours and have other things you can do in between, it shouldn’t make you feel like you’ve taken up your entire day. And the extra time in the fridge really does help produce a better end result – I think these croissants are a marked improvement on the previous ones I’ve made, in taste, texture and appearance. But the proof of the pudding, as they say, is in the eating. Carnivorous Boyfriend ate six – possibly seven – in one sitting. And although he’s a pretty enthusiastic taste tester of practically everything I make, I know something’s seriously good when complete silence descends, interrupted only by the odd contented murmur and a single short bout of coughing induced by inhaling a final flaky crumb. If you’ve never made croissants before, the method below might sound a little daunting, but I promise that if you follow the instructions exactly as they come (don’t skim read instructions or skip out the resting stages to save time), you’ll make a croissant worthy of the wonderful Bourke Street Bakery. Lovely soft layers break into flaky golden shards making them both decadent and light, crisp yet mouth-meltingly tender, and suitably rich with a beautiful natural buttery sweetness. 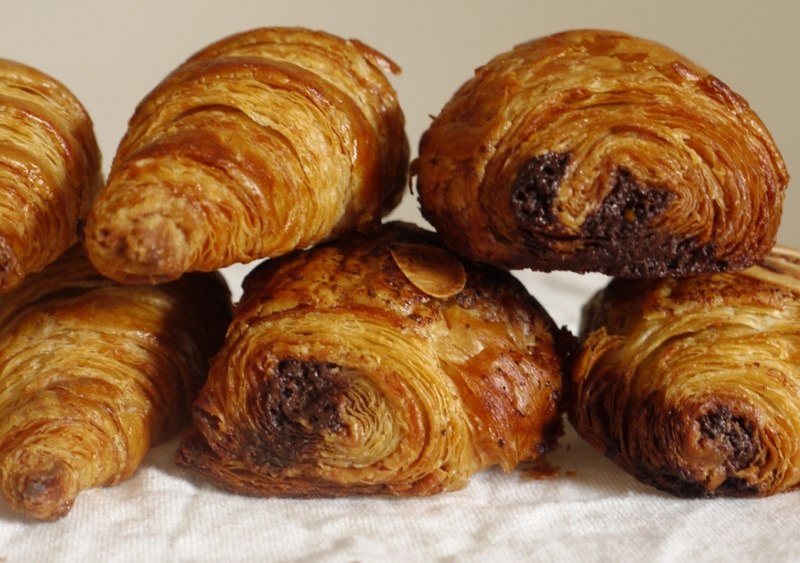 The plain croissants are so full of flavour you won’t want to put anything near them other than your mouth, while the chocolate ones are deliciously indulgent with bars of the darkest chocolate and a scattering of toasted flaked almonds. Whether it’s travelling for thousands of miles or spending a few extra hours in the kitchen, finding the perfect croissant is likely to be a labour of love. But once you taste that beautiful, buttery, flaky pastry fresh from the oven, I promise it’s worth every last little bit of effort. Plus you’ll have exerted yourself more than enough to justify taking a bite of that second croissant . . . or sixth . . . Put all the ingredients in the bowl of a stand mixer fitted with a dough hook. Process on low speed for 3 minutes or until a smooth, elastic dough forms. Gather into a ball, leave at room temperature for two hours, then refrigerate. You could also do this by hand – you’ll need to knead the mixture for about ten minutes. To make the croissants, put the flour, milk, sugar, salt, yeast and ferment in the bowl of a stand mixer fitted with a dough hook. Mix on low speed for four minutes then increase to high speed and mix for a further two minutes. Again, you could do this by hand – it will take about ten to fifteen minutes of good kneading. Gather your smooth, elastic dough into a ball, place inside a black bin liner, tie the top allowing air space for expansion, and pop in the fridge at least two hours, or preferably overnight. Once your dough is rested, remove it from the fridge, along with your butter. The aim is for butter and pastry to be about the same temperature – chilled but malleable. Place the butter between two sheets of baking parchment and gently pound with a rolling pin until you have a 20 cm square. Using a lightly floured rolling pin, roll your dough into a rectangle 20 x 40 cm. Place the butter on one half, and fold the dough over the top so it is completely enclosed, pinching the edges so no butter can escape. Carefully roll your butter enriched dough into a rectangle about 20 x 90 cm. Fold the rectangle from one long end by one-third, then fold the other third over the top so your dough is now 20 x 30 cm – the same as you would fold a letter three ways to fit it into an envelope. Put the dough in a plastic bag and refrigerate for 20 minutes – this will allow the gluten to relax. Repeat this folding and resting process twice more, each time rotating the dough 90 degrees. After the final roll, rest for a further 20 minutes, then remove from the fridge and roll into a rectangle approx. 25 x 100 cm and 5 – 8 mm thick. Cut the rolled dough into 18 even triangles. The base should be 9 cm wide and the two sides 21 cm high. Place your triangles on a tray lined with baking paper and refrigerate for 10 minutes, covered with a tea towel. Once rested, remove from the fridge, stretch each triangle out slightly, then roll up from the base to the tip, pressing the tip back into the dough to secure. Preheat the oven as high as it will go. Place the rolled croissants onto baking trays lined with baking paper spaced well apart*. Cover loosely with a damp tea towel and leave to rise in a warm place for about 2 hours, or until almost doubled in size. Make the egg wash by whisking all the ingredients together in a small bowl. 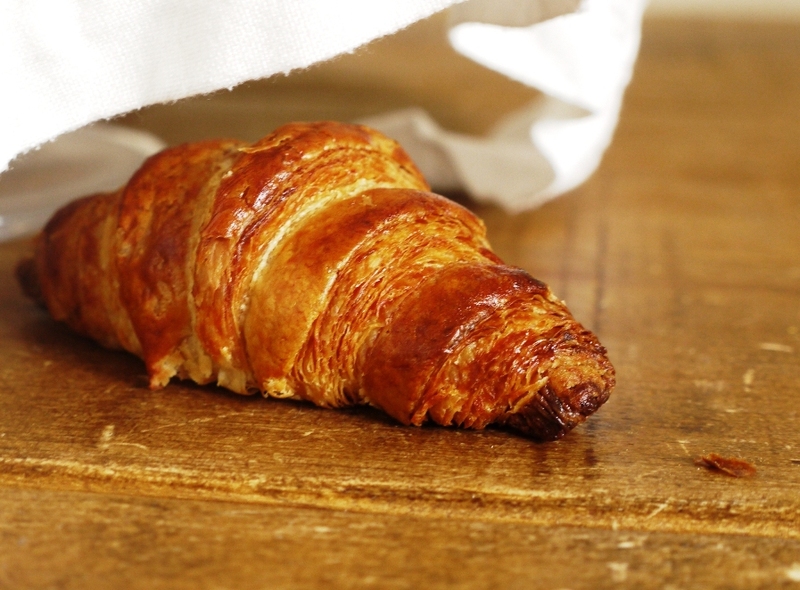 Remove the tea towel from your croissants, brush each one with the egg wash then place in the oven. Reduce the oven temperature to 190 degrees C and bake the croissants for about fifteen minutes, or until a beautiful, dark golden colour. Remove from the oven and allow to cool slightly before serving. Croissants taste best the day you make them, but they’re still pretty good reheated the next day. You can also freeze them after rolling but before proving (see * above), allowing an extra hour of rising time before baking. Oh my god these are some of the most beautiful homemade croissants I’ve ever seen. I’ve made them twice and liked the results, but I always have it on my list to try again (and again, hopefully) because I think we all don’t make croissants at home enough–that is unless you live in a big beautiful city that serves up perfect pastries right from your door practically. These look like the perfect croissants! Wow Little Loaf you are really pushing the boundaries. Croissants??????? You make it look so simple.. If only I had a stand mixer wirh a dough hook… I am sure the reason the result was so amazing is because you’ve put a lot of love in them! I really have to buy and add this book to the list of the best cookbooks. Did you manage to find those huge blocks of butter they use in bakeries? Well done , amazing talent! I’ve been nursing an ENORMOUS craving for croissants for weeks now. But unfortunately I don’t think I will be making my own any time soon as I like to pretend they’re not basically butter. Still, yours look great and I can only imagine how good they taste! Looks absolutely wonderful and props to you for making such perfect-looking croissants! These look absolutely spellbinding! I’m salivating at the thought of tucking into one with a steaming mug of coffee. And I can’t even begin to tell you how envious I am of your Chief Taster- he got to eat six?! Good work! Amy – aw, thank you. I’d love to make them more often myself – they are pretty time consuming but home made definitely does taste better! The Best Cookbooks – last time I made them I didn’t have a stand mixer and you can still get really good results, it’s just a little more labour intensive. I used 2 x 250g packs of butter pushed together but an industrial sized pack would have been even better! I had no idea the BSB had put out a book! As an ex-Sydneysider I really miss the place and seeing they have a book and the amazing results you’ve achieved makes me want to attempt my own croissants. Yours look incredible! So happy to have found your blog! I am slowly becoming a serious “bread head,” and I have a feeling I will be spending a lot of time here and learning a lot. Those croissants look incredible — no, perfect. I may have to set the recipe I use aside to try this one. Your croissants are truly BEAUTIFUL! Im about to start a gluten free trial (I know – are you appalled little loaf…?! 🙂 ). I went out with a bang with some Eggs Benedict and a burrito – but Im sort of wishing I’d given these babies a try now… Well done you! Ok. This looks ridiculously good. Ridiculous, because, I never thought such a perfect, multi-layered, flakey, feather- light crispy croissant, could ever be achieved at home. When I opened the post and saw the first picture I thought they were bakery bought!!!! Astounding. Reading the recipe it doesn’t sound extremely technical, just time hungry, but it is achievable if I break it down to cover a few days with all that overnight resting. I just might make these! Here in Doha, a proper, PROPER croissant like that is nigh on impossible to get! It’s far too doughy and I have a major, unsatisfied craving for it. Fabulous post and shall be making time to make these! I must, I just must!! Perfection! They look so light and fluffy, wish I could have a croissant (or two) for breakfast now. The Patterned Plate – aw, thank you, you’re too kind! Definitely do have a go at making them, they are so delicious. These look superb. Well done! Well, if appearance means anything, these are seriously delicious. They look perfect: flakey, buttery… Wow! These look incredible. I love croissants but I’ve never made my own. My favourite are the frangipane ones, so if you make those do send some my way. I’m off check out the book now. Yeast and me haven’t been the best of friends but I really must give these buttery croissants a try. I remember once when I was little, my Dad drove all over to 10 different bakeries to find me a perfect croissant. It’s a bonus, being the youngest daughter out of four. 🙂 Thanks for sharing the recipe, they look fantastic! Zita – haha, I’d love to! 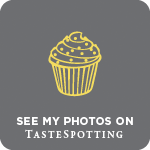 Nuts About Food – I promise they taste as good as they look! Laura – yep, I definitely need to make those bear claws, they look so delicious. Baker St – you definitely should! Young Wifey – haha, lucky you! Your croissants look perfect- love the dark color and flakey crust! I always imagine croissants to be tricky to make but these look totally authentic and worthy of any patisserie window. I think Fresh From the Oven’s challenge was croissants this month but I chickened out of doing it! These look great. Can I strongly suggest you try making the chocolate sour cherry biscuits from the book too? I’m going to go to Bourke Street Bakery for lunch with my little girls tomorrow-they make the most fantastic sandwiches with the exquisite bread that they bake. Beautiful–so amazingly flaky and golden! I’ve made croissants once; I love how this recipe uses a bit of brown sugar. I can easily imagine six being quickly downed in one sitting. I was VERY worried when I posted the Fresh from the Oven challenge for Croissants this month, as I had so many people saying that they could not make them……however, lots of people have made my recipe now with perfect results, so it’s SO nice to see your wonderful croissants and pain au chocolat here as testament that they are NOT that hard to make! The recipe is totally different from mine, but ever the student, I will give it a go I think! LOVELY pâtisserie, and so very professional looking! Now who needs to go to Sydney when we can just come knocking on your door? These croissants to look seriously good. I haven’t tried making any for very many years and when I did I used wholemeal flour, so the result wasn’t quite up to your standard! The best croissants I’ve ever eaten were in Switzerland – in fact they had wonderful pastries all round. When we were in Syndey last year, we missed Bourke Street and I still regret it. It sounds amazing. And I cannot tell you how stunned I am by your own croissants. They look perfect – flaky, buttery, golden. Wow! Karen – they are very daunting if you haven’t made them before as so many different stages, but once you get going it’s really no more difficult than normal bread or pastry – just more steps! 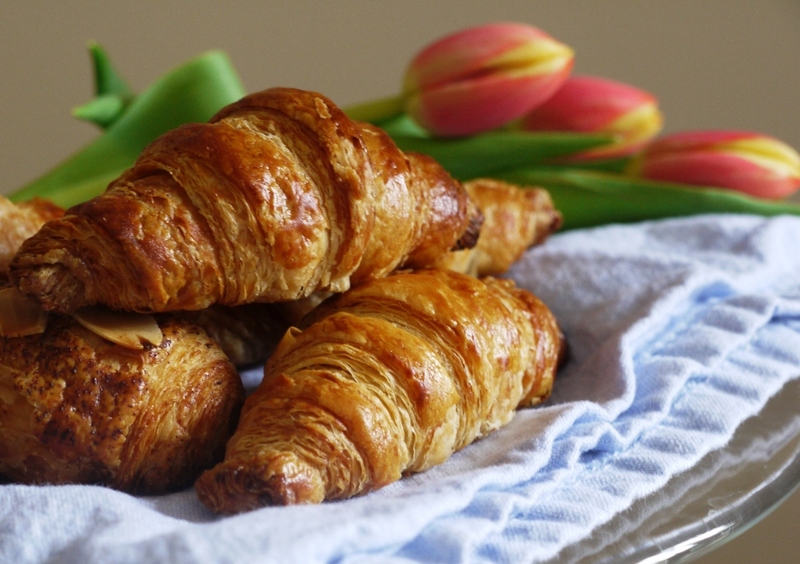 Joanna – I promise that with your baking skills you’d find croissants a walk in the park! Choclette – I’ve never been to Switzerland but can imagine they do lovely warming pastries – hopefully filled with lots of delicious Swiss chocolate! Wonderful! These look amazing and making the pastry takes so long. I remeber my arms felt like I had done a massive workout at the end so well done! Oh wow, your croissants…. I’m at a loss for words. They look perfect! I can almost taste them. I tried making them for the Fresh from the Oven challenge and they didn’t work so well (I even posted them though, no shame here!) I plan on trying again before the month is over and you have inspired me to do better. Those croissants look seriously good and as someone who will travel a long way for a good croissant, I’ll soon be knocking on your door!! Woh there! these look beautiful, really crispy and golden. I can’t bring myself to make any at the moment due to the masses of butter in them…plus I would put butter and jam on them too, but these look divine. Beautiful croissants. Gosh I miss that place. The ginger brulee tarts and the lam and harissa sausage rolls are especially fabulous. holy smokes! I wax nostalgic about the amazing croissant and brioche I had in France but haven’t really had any that matched the buttery flavour in North America. You are so lucky to be so close to perfection. And now you can even make it yourself! I’m so jealous! how perfect looking they are!! What a great job you did here!! I’m getting that book too! Heard many great things about it.. hehehe..
Cake Boule – because of all the resting the dough it doesn’t actually take it out of your arms too much but I do know what you mean! Delicio8 – thanks for your lovely comment – I really do believe practise makes perfect so definitely don’t give up! Elaina – thank you. Do look into the book, it’s absolutely wonderful. Tori – the bruleed tarts are next on my list to try, although they do come with a warning that they’re very tricky to make! Cake Brain – thank you! 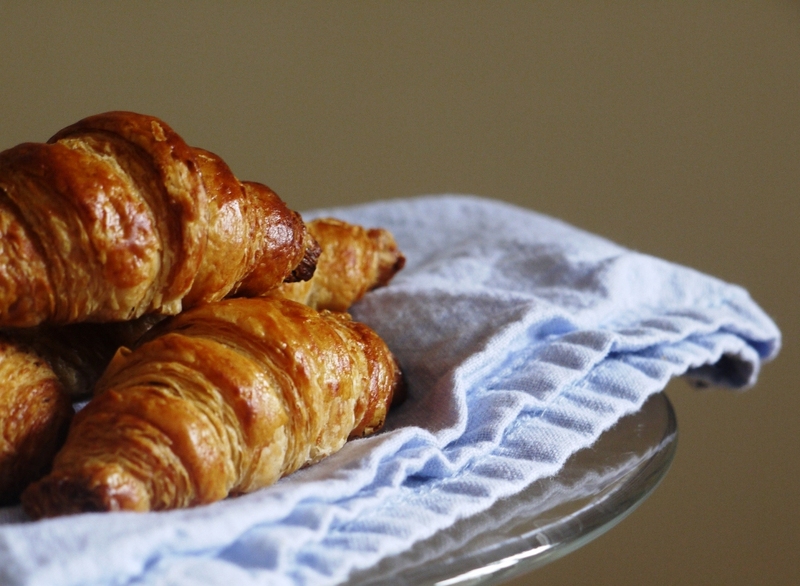 Definitely do give these a go if you love a flaky, buttery croissant. Terra – hope it helps – do let me know how you get on! Samology – thank you 🙂 Enjoy the book – it’s hard to decide what to bake first, everything looks so good! The color on those croissants is beautiful! And what a lovely texture too. I bet they’re scrumptious! Nooo – I’ve bought the book and I have no room for any more books! Couldn’t resist when I saw those croissants. I live down the road from Bourke St Bakery in Sydney, they are fabulous :D… Actually, I’ve always been so hooked on their chocolate prune brownies (the recipe is in the book too by the way!) that I’ve never actually tried their croissants! Now it’s top of my list! Russell – if I say so myself they were seriously good! Beautiful croissants! Pain au chocolat will be next on my list to try! I have this book and everything I’ve baked from it comes out so beautifully. Having conquered my fear of croissant making with Lavender and Lovages recipe for FFTO I’ll now try this one. Yours look so gorgeous. Sally – it’s SUCH a good book – so many more recipes I want to try! Recommend the raspberry and chocolate muffins highly. The most important thing when making croissants is time and attention to detail – as long as you allow yourself time and don’t try to skip any of the steps (such as resting the dough in between rolling) this recipe is fairly straightforward and should work. Do let me know how you get on and good luck! Being a Surry Hills resident I can testify to the amazing Boutke st Bakery. When a place has a line up 7 days a week they must be doing something right. The crossaint’s are great, but you also must try the sweets and breads. Your croissants look beautiful!! Thanks for such a detailed recipe, love to try this! Can I use instant yeast instead of fresh yeast? Would you be able to advise how much instant yeast I should use? You can definitely use instant yeast. I’ve not tried and tested this so you might need to play around with quantities but I’d suggest substituting with between half to one third the amount of yeast. Good luck and would love to hear how they come out! I have decided to finally take the plunge and make croissants at home have chosen to use your recipe. Yours look so perfect in the photographs and sound delicious. I am thinking of doing the final 2 hour rise in the fridge overnight instead of in a warm place. This would mean fresh croissants for breakfast. I am thinking it will work as I have successfully done this with other doughs but wondered if you had tried it with these croissants or if it is mentioned in the book? I am also thinking of cutting the recipe in half. Thank you. Lucy. Hi Kate! So I finally got around to baking these using the book. My arms ached for days after, but I agree with you, well worth the effort! (I’ve blogged about them here: http://tinyurl.com/9wk8fw7) Keep up the beautiful blog posts please, I absolutely love them! I live in colorado at a fairly high altitude. Do I need to adjust anything to ake it a high altitude recipe?